What does a Dad do when his eight year old asks Santa for a Wii Fit and a 4G iPhone? The answer is simple: laugh! 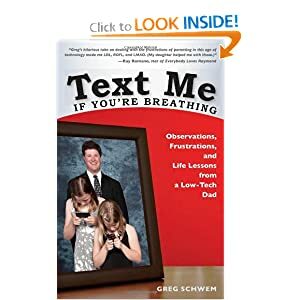 In Text Me If You're Breathing, stand-up comedian and technically challenged dad Greg Schwem accounts his mishaps and struggles with parenting in today's digital world Whether accompanying his daughter to the New York City Apple store, purchasing a high-tech swing set, tweeting while coaching Little League or trying to lay down cell phone rules, Schwem shows readers that technology, while complicated, can be hilarious. Along the way, Schwem also aims his barbs at Tiger Woods, the Consumer Electronics Show, in vitro fertilization, the National Spelling Bee and the movie Avatar. Insightful, heartfelt and always funny, Text Me If You're Breathing is proof that parenting will never come with technical support. Greg Schwem is a husband, father and twenty-year stand-up comedy veteran. He has appeared in concert with the likes of Jay Leno, Celine Dion and performed his show, Comedy With a Byte for corporations including Microsoft, Cisco Systems, IBM, McDonald's and United Airlines. This is the type of book that is so funny because you can relate to what the author is talking about. I am a few years removed to what the author grew up in, but even so, I could appreciate the nostalgia for the low-tech childhood that he had (as I had a similar one growing up in the mid to late 1970's and early 1980's). Though the book is nostalgic for simpler times, the author uses his humor and wit to bring out some great points for any reader. I loved how easy the book was to read and how well everything flowed together. I found the mix of humor and observations made for a quick read. I also loved the sentiments that he shared and ended up passing the book on to another dad after I was done and requested that he do the same. This was a fun book that any dad or parent will enjoy!